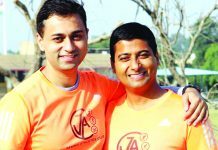 The State of Jammu and Kashmir which is striving hard to create a niche in the field of sports, had a mixed fortune in sports in the year 2016, with some extraordinary talented sportspersons keeping their State’s and also the Country’s flag high in some specific sports disciplines at the International scene and others failing to enhance their performance graph. 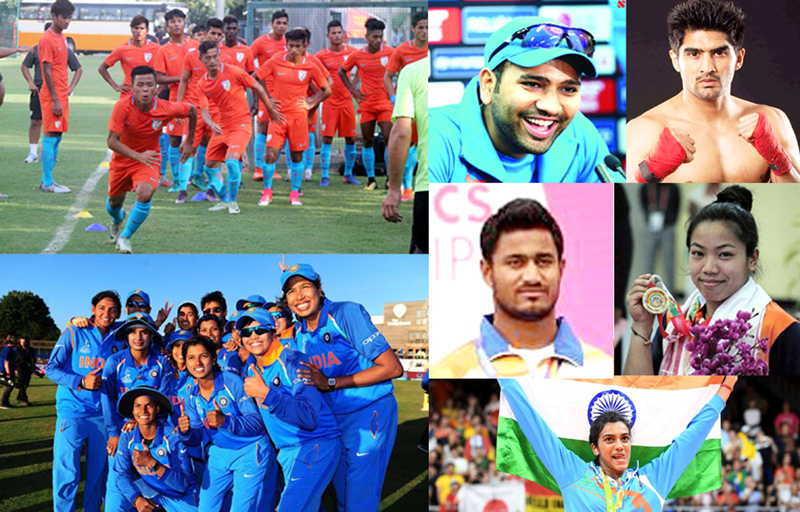 As per the custom, the players of a few medal winning sports once again shone at the highest level and created records, while the players of most of the games took part in various sports events just for the sake of participation. Ace wushu player, Surya Bhanu Partap Singh created history by winning silver in 8th World Cup at Xian China, gold in 11th SAF Games 2016, silver in Masters Challenge Cup and bronze in 5th Pars Cup at Iran, while another talented wushu player, Rajinder Singh bagged silver in 9th Asian Wushu Championship and bronze in 5th Pars Cup. Pardeep Kumar and Kamal Kishore also clinched bronze each in 11th SAF Games 2016 and 7th World Traditional Wushu Championship at China respectively. In 2016, Kuldeep Handoo, Chief Coach of Wushu in India, has the distinction of winning 11 gold, 2 silver and 3 bronze medals as coach in 11th SAF Games 2016, 4 silver and 5 bronze in 9th Asian Wushu Championship 2016 at Taiwan and 4 silver and one bronze in 8th World Cup at Xian in China. The State of Jammu and Kashmir won 5 gold, 4 silver and 3 bronze medals in National Canoe Polo, Canoe Slalom and Dragon Boat Championships in 2016. Two paddlers were selected for National Canoe Slalom Camp. The State canoeists were trained and coached by Bilquis Mir, who has made a mark at National and International scene as a coach. Fencers Tariq Ahmad, Vansh Mahajan and Riya Bakshi made the State proud by representing the Country in World Cup, Asian Championship and Open Tournament respectively. While Tariq represented India in Fencing World Cup, Riya played in Asian Championship and Vansh represented the Country in Open Tournament at Hong Kong and Thailand. 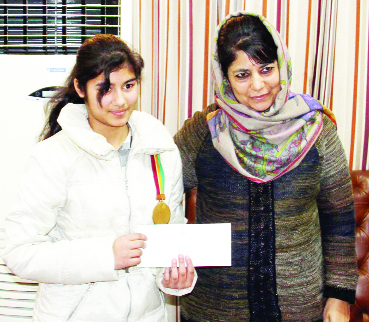 Moreover, J&K emerged overall Champion in Under-14 Nationals and bagged sabre bronze in Junior Nationals. The credit of producing International stuff in Fencing goes to Fencing coaches Shotu Lal and Rachna Jamwal. Golden girl Meenal Gupta won gold medal in Under-14 Commonwealth Chess Championship held in Sri Lanka in the month of July and August, 2016. Meenal, daughter of chess promoter Atul Kumar Gupta has an outstanding record at the domestic and National scene. 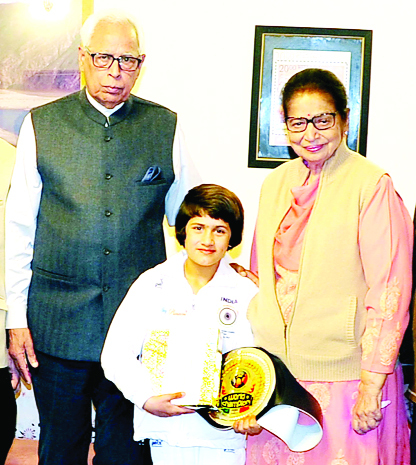 For the achievement in Commonwealth Games, Meenal was honoured by Governor NN Vohra and the First Lady and the Chief Minister of the State, Mehbooba Mufti in two different felicitation functions in Jammu recently. 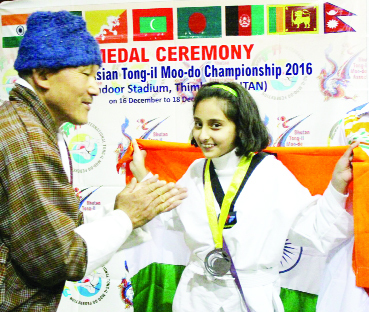 Young Tajamul Islam, a girl from Bandipora in Valley clinched gold in Under-8 years category of World Kickboxing Championship held at Italy. 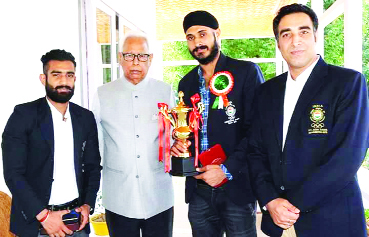 For keeping the Country’s Flag high at the International scene, Tajamul was felicitated by Governor, NN Vohra, Chief Minister, Mehbooba Mufti and Minister for Sports, Molvi Imran Raza Ansari. 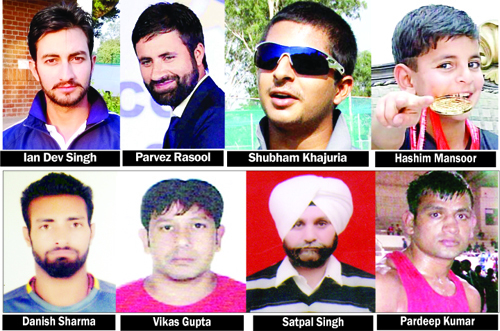 Boxers Pardeep Sharma, Ashish Jasrotia and Heena Choudhary got the National selectors nod to find a place in India Camp. After performing brilliantly in the National Championships, these boxers made to the India Camps. They are being imparted training by the Boxing coach, Anil Wadhera. 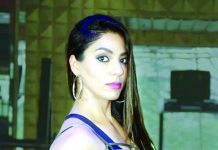 Mehroosh Manzoor Paul, Aqsa Fareed Khan and Hashim Manzoor won medals in different Martial Arts at the International Level. This is really a landmark achievement for these boys and girls from the Valley. 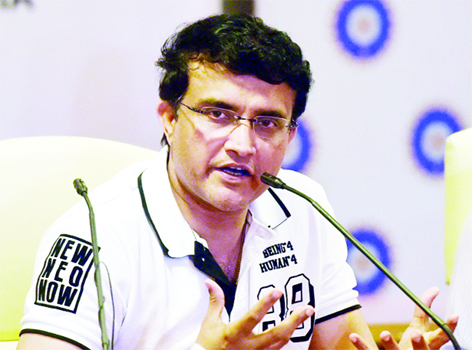 All these sports icons have been honoured by the Government in different functions. Skipper of J&K Ranji Trophy team, Parvez Rasool Zargar emerged top all-rounder in India in Ranji Trophy 2016, while promising Shubham Khajuria and talented Ian Dev Singh Chauhan made their willow talk during the current season. Parvez took 38 wickets and scored 629 runs in Ranji Trophy 4-day matches to be at the top among the all-rounders, Shubham scored 777 runs with two hundreds to be among the leading run getters and Ian contributed 702 runs with two tons in the season. Jammu and Kashmir emerged runners-up in both boys and girls Junior National Tennis Ball Cricket Championship held at Karnal, Haryana recently. 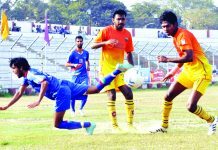 J&K was defeated in both the finals by formidable Goa. Deputy Commissioner Jammu, Simrandeep Singh, Chairman of Jammu District J&K State Sports Council, took a unique but very healthy initiative of organizing School Olympics in the district with an objective to promote Sports culture and provide opportunity to budding players to showcase their sporting talent. As many as 1500 girls and 2500 boys participated in this sports extravaganza in around ten sports disciplines including football, hockey, basketball, table tennis, kabaddi, athletics and volleyball etc. Outstanding Gymnast of BSF School Paloura, participated and performed well in 3rd Rhythmic Gymnastics Thailand Open Championship held in the month of November 2016. She won 6thplace in the Championship and added another feather to her cap. 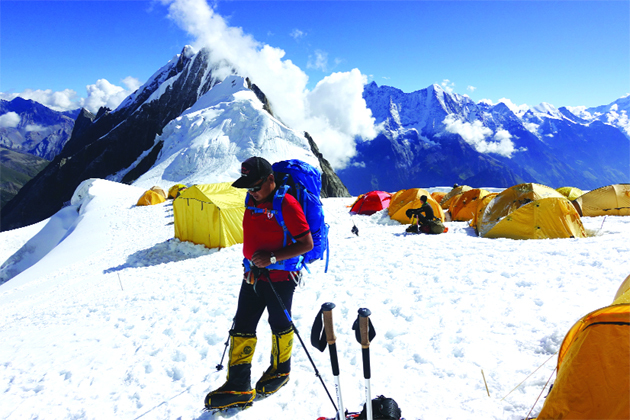 Her School Principal, Dr SK Shukla has termed her achievement as the proud moment for the School and the State as well. Judoka Danish Sharma clinched bronze in All India Inter-University Fencing Championship-2016. 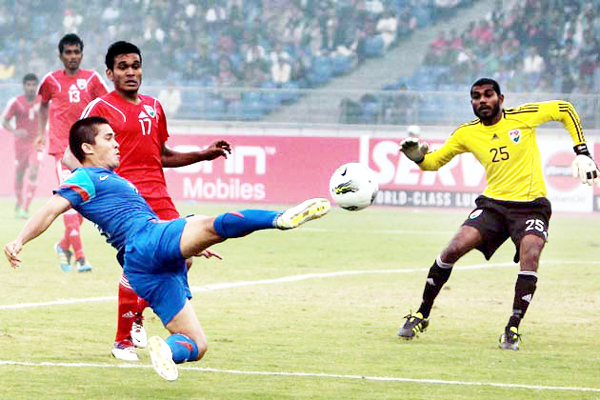 He attributes his success to his coach Suraj Bhan Singh and mentor Vikas Gupta. Former outstanding Judoka and promoter of Judo in the State, Vikas Gupta represented Indian Judo team that participated in Senior Asian Judo Championship held at Tashkent in Uzbekistan for qualifying in Rio Olympics as manager. Ace India Judoka, Avtar Singh was picked from the same Championship to represent the County in prestigious Olympic Games. Outstanding Football Coach, Satpal Singh Kala became the first coach from the State to clear prestigious FIFA Senior Coaching Course in August 2016. Satpal has the distinction of producing International stuff from the State in Mehrajudin Wadoo and Ishfaq Ahmad. He has also the reputation of being very good organizer. 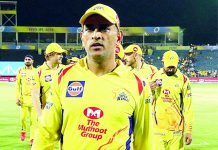 In nutshell, J&K though, sparkled in most of the Martial Art events and made the State proud in a few sports disciplines, yet the year 2016 witnessed dismal show by the players in most of the major games like hockey, football, basketball, table tennis, cricket and athletics. Representing India in the Asian Championship held at Bangkok recently, wherein Indian team won gold in women and silver in men, Jammu and Kashmir State Roll Ball players namely Rakshak Jandial, Ankita Chopra and Garvita Gupta brought laurels to the State as also to the Country. 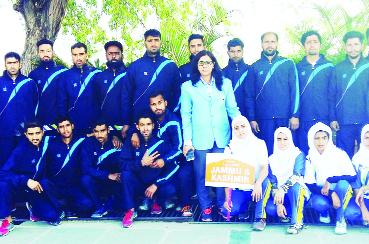 The players attribute their success to Chairman, Technical Committee Roll Ball Federation of India, Madhu Sharma, who imparts training to them in Jammu.